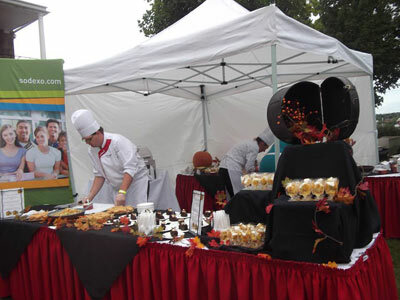 The University of New Brunswick Fredericton's Sodexo executive chef Leanne English, catering chef Kris Campbell, catering director Cindy McCoy, catering manager Amy Vye, and cook Duc-Vinh Tao won the title of "Favourite Overall Exhibitor" at the 13th Annual Feast in the Field event, held Sunday, September 8 in Fredericton. Feast in the Field is a yearly fundraising event for Ability New Brunswick. Visit Dining Services by Sodexo for news, events and information about residence and retail dining services.